Brushed silver softly catches light as it delicately encircles the wrist. Hand-carved, the variations on the surface create a fluid effect. One-of-a-kind. Beveled edge for a comfort fit. Signed on the inner surface. Organic designs carved into this ring reflect light so that the ring a hint of flash. Tapers off the finger, like Shiva’s flame. Beveled on the inside and slightly squared for a comfort fit. One-of-a-kind. Signed on the inside. Sterling silver. Moonstone is said to stimulate the pineal gland and help to balance hormones. It is also said to increase intuition and to bring good fortune. This is beneficial stone for women. (Charge it up under the full moon to increase it’s powers). Whether or not magical moonstone properties are real, it’s a beautiful stone. This one is translucent white. 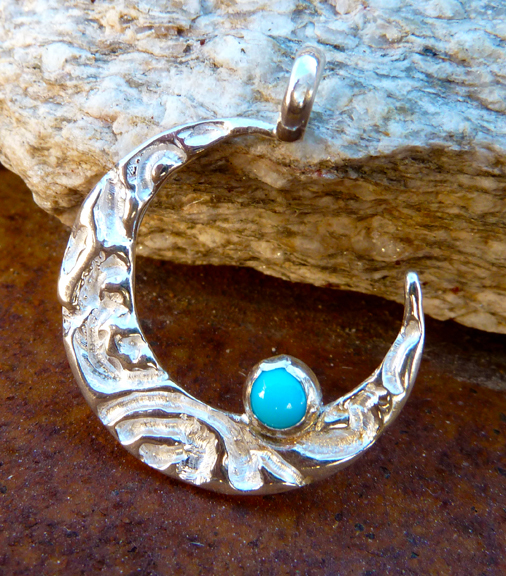 The crescent is hand-carved silver. About 1 1/4 inches in diameter. Signed on the back. One-of-a-kind. 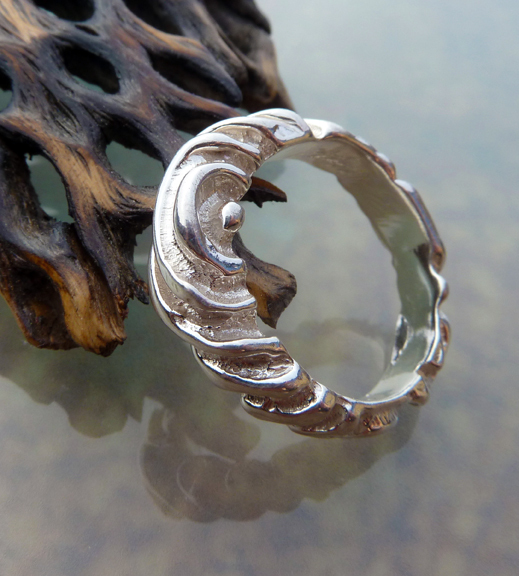 The carvings in this ring create the look of movement rising toward the top of the ring. This ring is slightly thicker at the top, sloping toward a gentle apex. A slightly smaller point than my other ring, Shiva’s Flame. Shiva is often depicted in images as Nataraja, or the cosmic dancer Koothan, where we see him dancing with a flame rising from his palm. The dance is to destroy the old universe and make room for the Divine to start the universe anew. (Gently) call on Shiva when you need change or purification. The inner edges of this ring are beveled for a comfort fit. One-of-a-kind. Signed on the inside of the ring. Ever look at the sky in the daytime and see the moon? 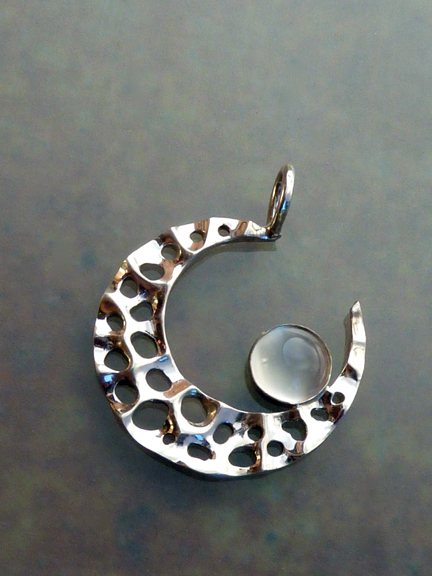 This is what this pendant reminds me of, daylight moon. Turquoise blue of the southwestern sky is magical. Hand-carved whitened silver. The grooves in this pendant pick up the light, making it shimmer. Like my other moons, this piece is about 1 and 1/4 inches in diameter. One-of-a-kind. A substancial bracelet, this piece is rounded on the inner edges and curved to fit comfortably on the wrist. 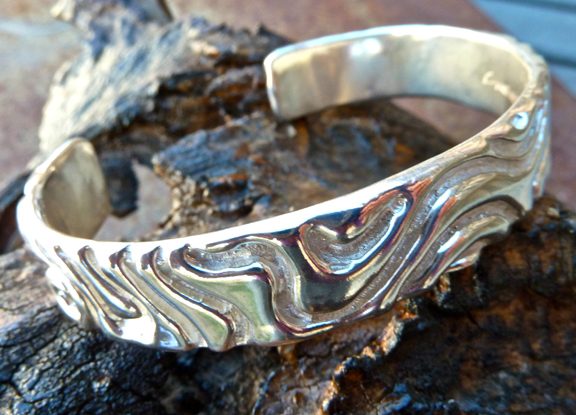 This bracelet is hand-carved brushed and polished silver. The cuff is approximately 1 and 1/4 inches wide. Bold and beautiful – a gorgeous addition to any wardrobe! 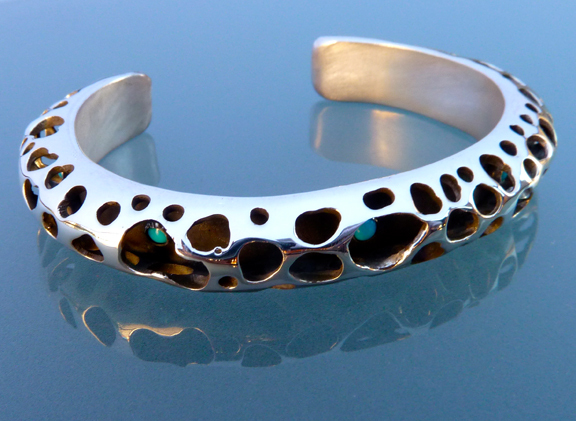 This hand-carved hollow form bracelet is a take off on the Ultra Mod Crater Cuff and my turquoise shadowbox pieces. A very modern piece. Designed to sit low on the wrist. This piece is about 1/2 of an inch thick and 1/4 of an inch deep. This piece is being donated to Planned Parenthood Advocates of Arizona and will be auctioned at the March 8th, 2012, annual event Celebrating Planned Parenthood’s Commitment to Women’s Health in Flagstaff, AZ. This bracelet sits low on the wrist. 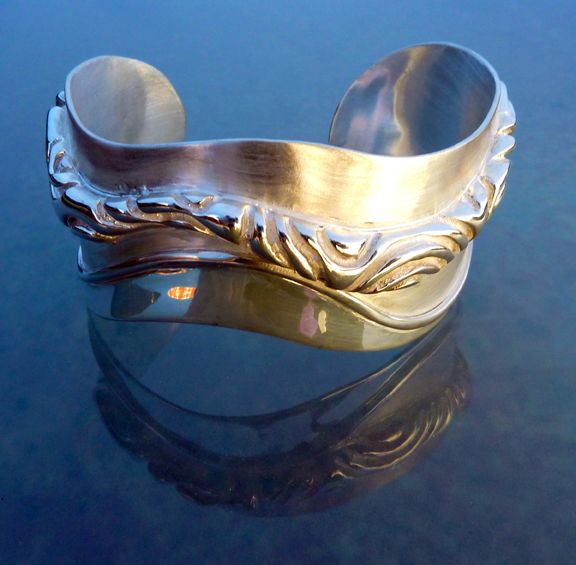 The straight lines of the bracelet shape are juxtaposed with the flowing lines of the carving. Hand-carved silver has it’s own unique shimmer. This piece is about half an inch wide. For women it would fit on a larger wrist, for men, a medium-sized wrist. 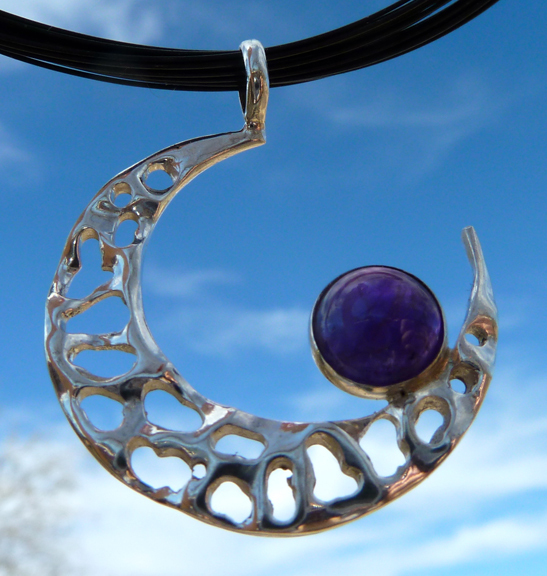 The color of the amethyst in this pendant is such a rich purple it practically glows. Amethyst is traditionally worn to guard the wearer from drunkenness and poison. (Many people in recovery love this stone). Amethyst is also known to bring about pleasant or prophetic dreams. It is aligned with the Crown, or Seventh Chakra, so it may open the wearer to spiritual wisdom. This hand-carved pendant measures 1 1/2 inches in diameter. This is a commissioned piece. 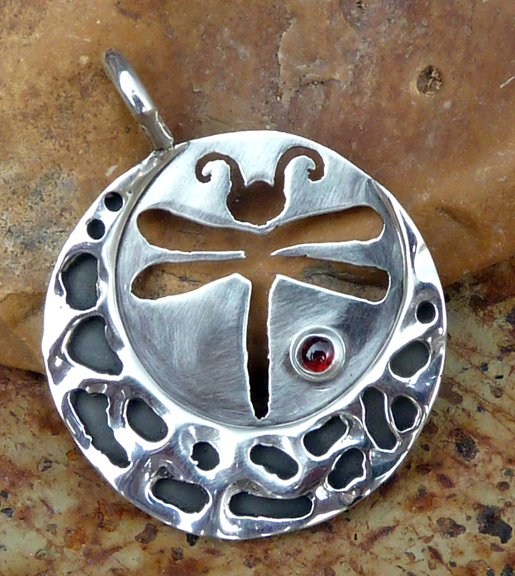 The pendant measures about one inch in diameter and is hand-hammered and hand-carved silver with a garnet. Similar items may be made to order. Contact matagisorensen@gmail.com.